I figured I was parallel to the road anyway and I saw some electrical posts above me. I climbed above a low embankment and came onto more fields and another embankment. I decided to backtrack. The couple and the guide were now gone probably heading to Sin’ Chai through the rice fields. Back at the road, that when I came upon the kids. I followed them for about a hundred of meters before the one I had asked turned left to a track. The others stopped and watched. I continued walking. The sound of a dog barking and the pigs scurrying led the girl back to the main road. They all scurried past me again. They were soon gone from my sight and I was alone on the road. Occasionally, motorbikes heading to the opposite direction passed me. I heard the sound of rushing feet and another group of school girls were behind me. “Sin’ Cha?” I asked again. They nodded, laughed, then ran. When I came to them, they turned to a dirt track that went up an embankment. “Sin’ Cha?” I asked. They pointed to my direction. The road made a sharp turn to the right with a little ascent. As I heaved myself, the kids were just coming up from the embankment. It was a short-cut! They were giggling as I laughed at them and shook my head. Either they were playing a game with me or they thought I wouldn’t be able to handle the track. 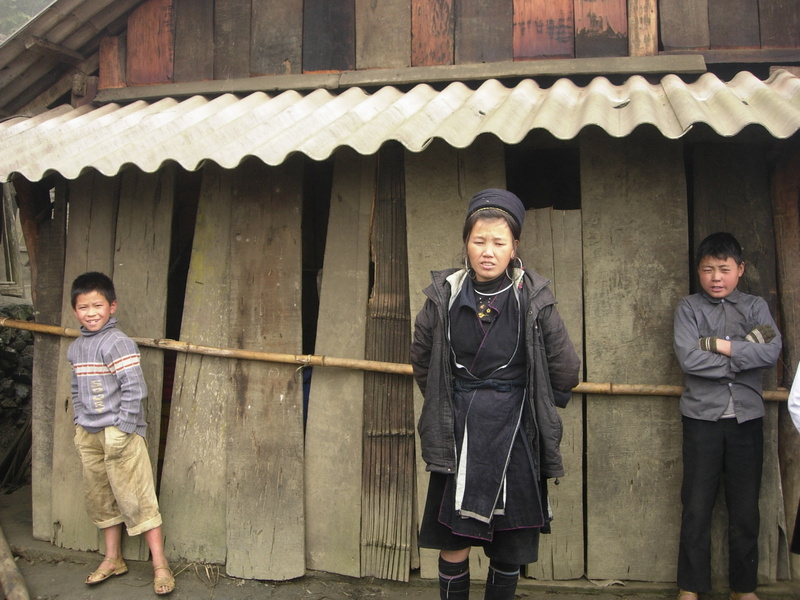 When we reached a wooden house, the kids entered the open door and watched me. I smiled at them as if to say good-bye. When I passed the school, the sign read “Sin’ Cha.” I had found the village. 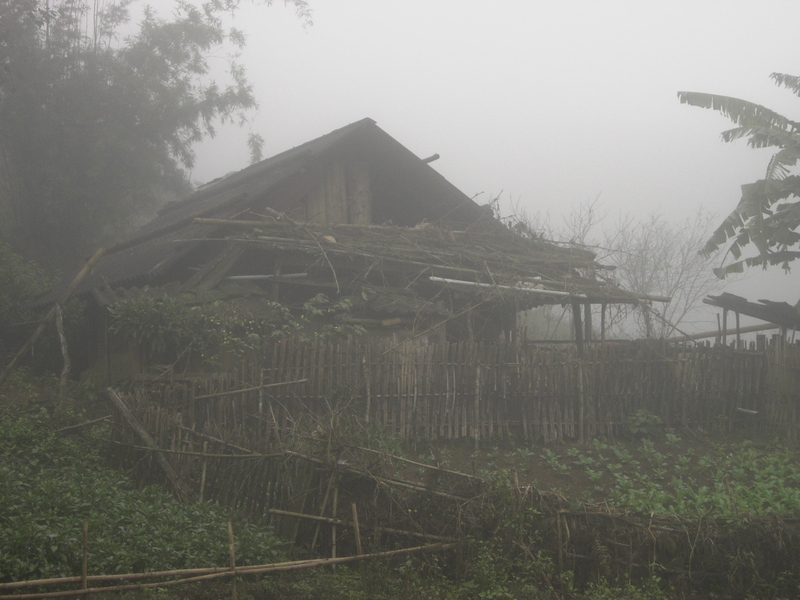 As the fog grew denser, the road turned into a narrow pavement that cut through a village of one-room wooden houses similar to those I had seen in my other treks. 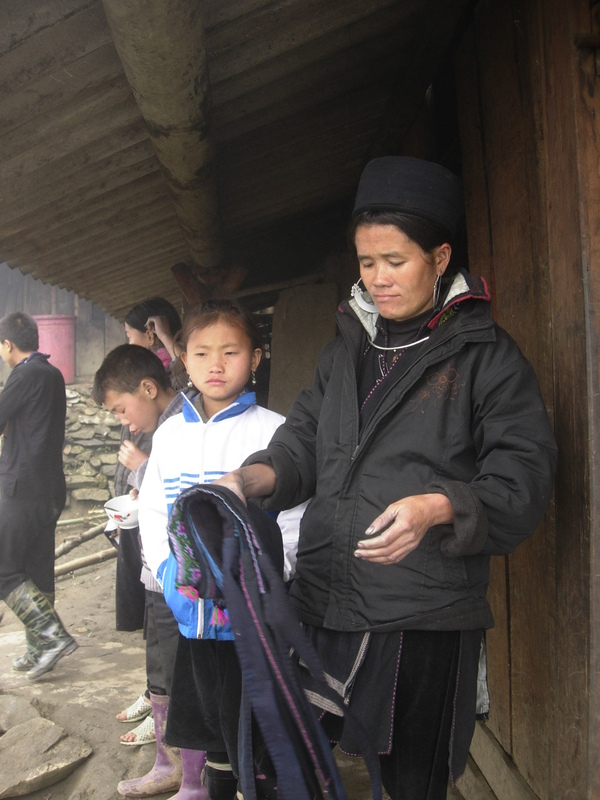 Two H’mong women sat embroidering on the open doorway of their house. “Sin Cha?” I asked. 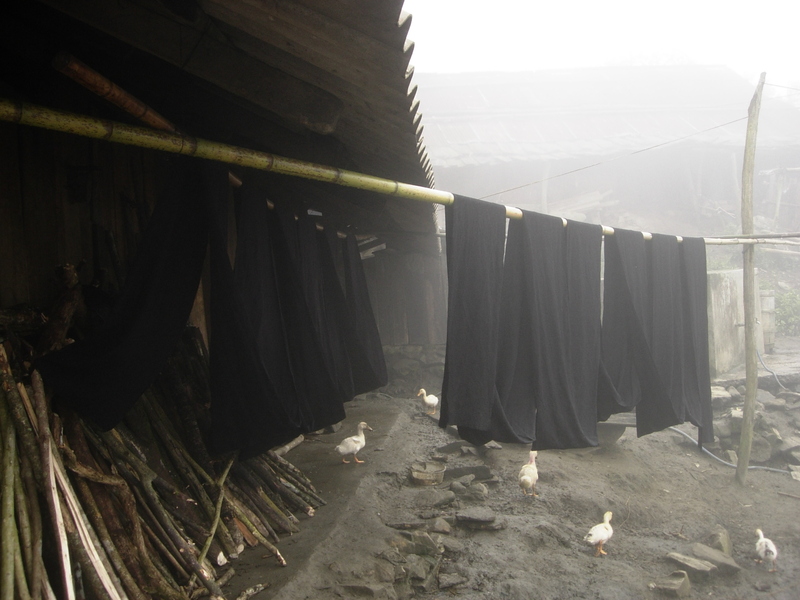 She nodded and said “Sin’ Cha.” It was quiet all around and I was surrounded by old wooden houses while bolts of indigo hung out to dry. The only other sound was a dog barking somewhere and some pigs scrounging around for food. The fog had cleared about. The pavement continued way past where the houses ended. I turned back and asked the women, “motorbike?” She looked at me puzzled. I made motions with my hands and repeated the word. She seemed to have understood as she want to an older woman who had emerged from another house. I looked around the village. By now, news had probably traveled fast that there was a lone stranger looking for a motorbike. People had gathered around. Unlike the women who readily agreed to be photographed, the young man would shy away whenever he came into range of my camera. They had a good laugh seeing themselves on the screen. Except for the woman I had asked for a motorbike, no one came up to me saying “buy something for me?” in that melodious H’mong voice. Several minutes later, the older woman was back. It was 50,000 VND for a motobike back to Sapa which was just the amount Lily in Hanoi had told me. A man who looked like he was in his late 40’s came out with a motorbike. People had gathered to watch me get on the motorbike. The helmet wouldn’t fit with my H’mong cap on so I took it off. They all laughed on seeing my bald head. I climbed on the back of the bike and waved good-bye. “Slowly, slowly, ” I told the driver. He gingerly and carefully navigated the wet narrow pavement leaving Sin’ Chai behind us. 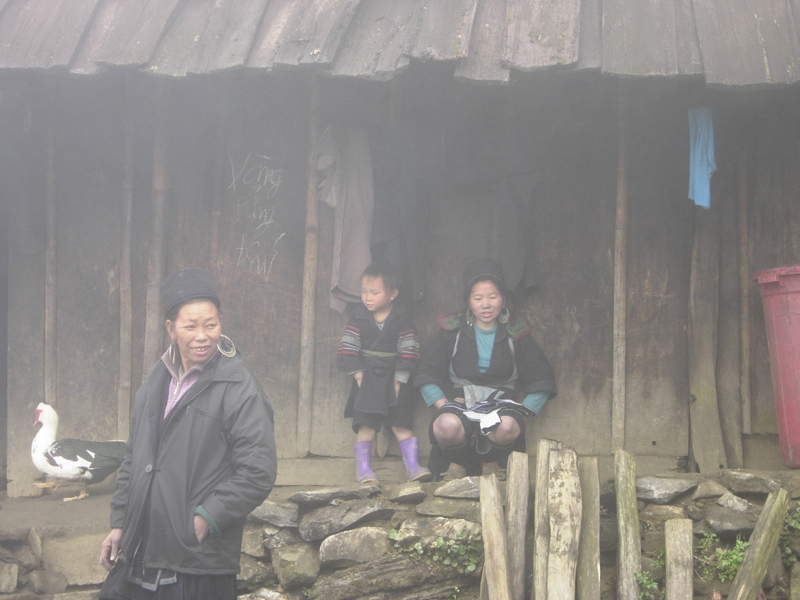 A few minutes later, we were back at the asphalt road to Sapa. He dropped me at the market and shook my head as I gave him the 50,000 note. He seemed genuinely grateful. As I turned to the market, I realized I still had the helmet on. I frantically called him. Fortunately, the other drivers saw me and waved him back. I handed the helmet to him. Again, another grateful smile. We passed by a couple of people who were probably heading to Sin’ Cha too. I was glad I arrived before them. After the tourist circus that accompanied the other villages I went to, it was wonderful to had an entire village for myself.